Is the Pope about to bestow John Lennon a sainthood!? Tissue engineering has made possible this doubly innovative operation – the first trachea transplant and the first tissue transplant to be performed without the need for immunosuppression. Professor Paolo Macchiarini, Head of the thoracic surgery department of Hospital Clínic of Barcelona, has led the basic research and the international team formed by the universities of Bristol, Padua and Milan, who contributed to this success. The transplanted tissue is a hybrid from a donor that was re-populated with stem and epithelial cells from the recipient. Five months later, Claudia Castillo, who required the operation to save a lung following tuberculosis, is in perfect health. Scientists at Penn State are leaders of a team that is the first to report the genome-wide sequence of an extinct animal, according to Webb Miller, professor of biology and of computer science and engineering and one of the project's two leaders. The scientists sequenced the genome of the woolly mammoth, an extinct species of elephant that was adapted to living in the cold environment of the northern hemisphere. They sequenced four billion DNA bases using next-generation DNA-sequencing instruments and a novel approach that reads ancient DNA highly efficiently. "Previous studies on extinct organisms have generated only small amounts of data," said Stephan C. Schuster, Penn State professor of biochemistry and molecular biology and the project's other leader. "Our dataset is 100 times more extensive than any other published dataset for an extinct species, demonstrating that ancient DNA studies can be brought up to the same level as modern genome projects." The researchers suspect that the full woolly-mammoth genome is over four-billion DNA bases, which they believe is the size of the modern-day African elephant's genome. Although their dataset consists of more than four-billion DNA bases, only 3.3 billion of them — a little over the size of the human genome — currently can be assigned to the mammoth genome. Some of the remaining DNA bases may belong to the mammoth, but others could belong to other organisms, like bacteria and fungi, from the surrounding environment that had contaminated the sample. The team used a draft version of the African elephant's genome, which currently is being generated by scientists at the Broad Institute of MIT and Harvard, to distinguish those sequences that truly belong to the mammoth from possible contaminants. "Only after the genome of the African elephant has been completed will we be able to make a final assessment about how much of the full woolly-mammoth genome we have sequenced," said Miller. The team plans to finish sequencing the woolly mammoth's genome when the project receives additional funding. 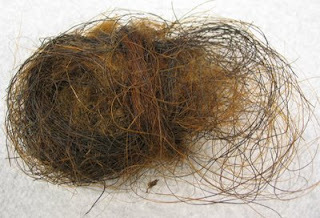 Ball of permafrost-preserved mammoth hair containing thick outer-coat and thin under-coat hairs. Credit: Stephan Schuster lab, Penn State University. The team sequenced the mammoth's nuclear genome using DNA extracted from the hairs of a mammoth mummy that had been buried in the Siberian permafrost for 20,000 years and a second mammoth mummy that is at least 60,000-years-old. By using hair, the scientists avoided problems that have bedevilled the sequencing of ancient DNA from bones because DNA from bacteria and fungi, which always are associated with ancient DNA, can more easily be removed from hair than from bones. Another advantage of using hair is that less damage occurs to ancient DNA in hair because the hair shaft encases the remnant DNA like a biological plastic, thus protecting it from degradation and exposure to the elements. The researchers previously had sequenced the woolly mammoth's entire mitochondrial genome, which codes for only 13 of the mammoth's roughly 20,000 genes but is relatively easy to sequence because each of the mammoth's cells has many copies. In their most recent project, the team sequenced the mammoth's nuclear genome, which codes for all the genetic factors that are responsible for the appearance of an organism. The two methods combined have yielded information about the evolution of the three known elephant species: the modern-day African and Indian elephants and the woolly mammoth. The team found that woolly mammoths separated into two groups around two million years ago, and that these groups eventually became genetically distinct sub-populations. They also found that one of these sub-populations went extinct approximately 45,000 years ago, while another lived until after the last ice age, about 10,000 years ago. In addition, the team showed that woolly mammoths are more closely related to modern-day elephants than previously was believed. "Our data suggest that mammoths and modern-day elephants separated around six-million years ago, about the same time that humans and chimpanzees separated," said Miller. "However, unlike humans and chimpanzees, which relatively rapidly evolved into two distinct species, mammoths and elephants evolved at a more gradual pace," added Schuster, who believes that the data will help to shed light on the rate at which mammalian genomes, in general, can evolve. The team's new data also provide additional evidence that woolly mammoths had low genetic diversity. "We discovered that individual woolly mammoths were so genetically similar to one another that they may have been especially susceptible to being wiped out by a disease, by a change in the climate, or by humans," said Schuster. Drawing of a woolly mammoth. Members of the team previously ruled out humans as a cause of extinction for at least one of the Siberian sub-populations — the group appears to have gone extinct at least 45,000 years ago at a time when there were no humans living in Siberia. However, much debate still remains regarding the causes of extinction for the other group and for those populations that lived in other places, such as North America. 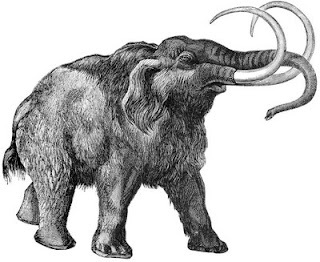 Currently, the team is searching the mammoth's genome for clues about its extinction. "For example," said Miller, "most animal genomes contain integrated viral sequences and, though these are not directly associated with disease, evidence of multiple recent integration events could indicate a perturbation of virus-host interaction that might be responsible for disease. Alternatively, it might turn out that long generation times and limited out-breeding result in accumulation of deleterious genetic mutations. We are considering a number of possible causes of extinction." The new data are allowing the Penn State team to begin looking for genetic causes of some of the mammoth's unique characteristics, such as their adaptation to extremely cold environments. For instance, the team already has identified a number of cases in which all previously sequenced mammals, except mammoths, have the same protein segment. "One has to wonder whether a particular protein that has remained the same in animals for several billion years of combined evolution and then became different in mammoths could result in a mammoth-specific trait," said Miller. Investigating the unique characteristics of woolly mammoths, and why they went extinct, are just some of the many tasks that the research team plans to pursue now that they have access to such a large quantity of sequence data. "This really is the first time that we have been able to study an extinct animal in the same detail as the ones living in our own time," said Schuster. Another significant aspect of the study is that it was completed by a small group of scientists at a relatively low cost and over a short period of time, whereas previous reports of modern mammalian genome sequences — including human sequences — have taken millions of dollars and several years of analysis by large groups of scientists to complete. Miller hopes that after he completes a few additional genome projects he can produce computer software that will enable others to perform low-cost mammalian genome analysis, and Schuster already is preparing to decode extinct genomes at an even faster pace. Schuster hopes that lessons learned from the mammoth genome about why some animals go extinct while others do not will be useful in protecting other species from extinction, such as the Tasmanian devil, whose survival is threatened by a deadly facial cancer. "In addition," added Schuster, "by deciphering this genome we could, in theory, generate data that one day may help other researchers to bring the woolly mammoth back to life by inserting the uniquely mammoth DNA sequences into the genome of the modern-day elephant. This would allow scientists to retrieve the genetic information that was believed to have been lost when the mammoth died out, as well as to bring back an extinct species that modern humans have missed meeting by only a few thousand years." 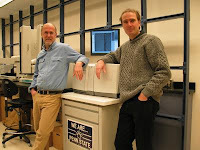 About the project: In addition to being members of the faculty of Penn State's Eberly College of Science, Miller and Schuster are researchers associated with Penn State's Center for Comparative Genomics and Bioinformatics. The study also involved researchers from the Severtsov Institute of Ecology and Evolution and the Zoological Institute in Russia, the University of California, the Broad Institute, the Roche Diagnostics Corporation, and the Sperling Foundation in the United States. Penn State, Roche Applied Sciences, a private sponsor, the National Human Genome Research Institute, and the Pennsylvania Department of Health funded this research. More information about this project is on the Web at the Mammoth Genome Project. ‘Orphan’ Genes Importance in Evolution Tuesday, 18 November 2008 Closely related animal species share most of their genes and look almost identical. However, minor morphological differences allow us to tell them apart. What is the genetic basis for these differences? Often, the explanation is provided by minor changes in spatial and temporal activity of transcription factors - "regulator" genes that are conserved throughout the animal kingdom. However, every group of animals also possesses a small proportion of genes, which are, in contrary, extremely variable among closely related species or even unique. For example, a gene may be present in one species or animal group, but not in any other. 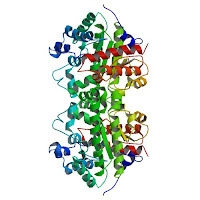 Such genes are referred to as "novel," "orphan" or "taxonomically restricted". Their function and origin are often obscure. What are these genes needed for? A new paper, published in this week's issue of the online open access journal, PLoS Biology, explores this question in the freshwater polyp Hydra, which belongs to the same branch of the evolutionary tree as jelly fish. These animals are small (several mm long), predatory creatures, with a tube like body-form that ends in a mouth surrounded by mobile tentacles. They are of particular interest to scientists for their regenerative properties, and because they appear to be biologically immortal; not undergoing the aging process that affects all other known animals. In this paper, a team of scientists from the Christian-Albrechts-Universität zu Kiel in Germany, used transgenic polyps to uncover the role of "orphan" genes in these morphologically-simple animals. The work, led by Thomas Bosch reports that a family of "novel" genes is responsible for morphological differences between two closely related species of fresh water polyps called Hydra. Their most remarkable finding is that a secreted protein, encoded by "novel" gene Hym301, controls the pattern in which the tentacles in Hydra develop. "We knew that these genes were important, but it was in no sense simple to demonstrate that," says Konstantin Khalturin, first author of the PLoS Biology paper. 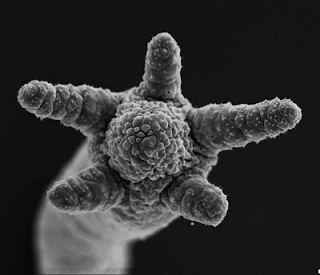 A freshwater polyp Hydra and its tentacles during bud formation. FoxJ1 helps cilia beat a path to asymmetry Monday, 17 November 2008 New work at the Salk Institute for Biological Studies reveals how a genetic switch, known as FoxJ1, helps developing embryos tell their left from their right. While at first glance the right and left sides of our bodies are identical to each other, this symmetry is only skin-deep. Below the surface, some of our internal organs are shifted sideways — heart and stomach to the left, liver and appendix to the right. Creating this left-right asymmetry is a key step in early embryonic development, and requires hundreds of tiny hair-like structures called nodal cilia to beat in unison. Like microscopic conductors, cilia orchestrate a flow of embryonic fluid from right to left that allows the growing tissues to orient themselves. The current study provides new insight into the crucial role FoxJ1 plays in directing the development of these cilia. 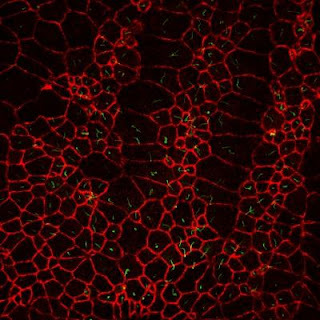 "This one transcription factor regulates a whole suite of genes needed to coordinate the formation of nodal cilia," says Christopher R. Kintner, Ph.D., a professor in the Molecular Neurobiology Laboratory, who led the study. Strikingly, FoxJ1 can induce cilia to form on the surface of cells that do not usually have them, the Salk researchers report in this week's early online edition of Nature Genetics. Their findings may one day lead to a cure for ciliopathies, diseases that result from malfunctioning or damaged cilia. Cilia — tiny hair-like protrusions found on certain cell types — come in three flavours. Motile cilia crowd the surface of specialized cells and move in harmony to generate liquid flow. They are used to sweep mucus and dirt out of our lungs and in females to propel the egg from the ovary through the Fallopian tube into the uterus. Unlike motile cilia, sensory cilia usually number just one per cell and are used to relay information back to the cell about its surroundings. A third and less characterized subtype are nodal cilia. Nodal cilia share certain features with both their sensory and motile counterparts; they exist one per cell yet function to generate the fluid movement during embryo development that is crucial to forming the left-right asymmetry. In the developing embryo, nodal cilia (shown in green) orchestrate a flow of embryonic fluid from right to left that allows the growing tissues to orientate themselves. Credit: Courtesy of Jennifer Stubbs, Salk Institute for Biological Studies. 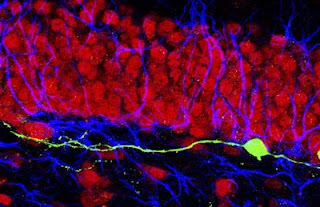 Newborn Neurons in the Adult Brain Can Settle in the Wrong Neighbourhood Wednesday, 12 November 2008 A new study published in this week's PLoS Biology could have significant consequences for neural tissue transplantation to treat brain injuries or neural degeneration. Researchers at the Salk Institute for Biological Studies report that inactivating a specific gene in adult neural stem cells makes nerve cells emerging from those precursors form connections in the wrong part of the adult brain. The research team, led by Professor Fred H. Gage, Ph.D., discovered that a protein called cdk5 is necessary for both correct elaboration of highly branched and complex dendrites, a kind of antennae, which are extended by neurons. 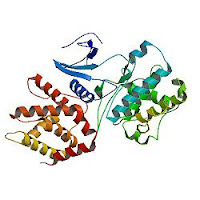 Cdk5 is also involved in the proper migration of cells bearing those antennae. Previously described functions of cdk5 are manifold, among them neuronal migration and dendritic path-finding of neurons born during embryonic development. "The surprising element was that the dendrites of newborn granule cells in the adult hippocampus lacking cdk5 stretched in the wrong direction and actually formed synapses with the wrong cells," explains Gage. Synapses are the specialized contact points where dendrites receive input from the long processes, or axons, of neighbouring neurons. The investigators injected retroviruses into the hippocampus of adult mice to tag and knock out cdk5 activity in newborn granule cell neurons. These findings offer extremely valuable, unanticipated insight. "Our data shows that cells that fail to find their 'right spot' might actually become integrated into the brain and possibly interfere with normal information processing," says the study's lead author Sebastian Jessberger, M.D., a former postdoc in the Gage lab and now an assistant professor at the Swiss Federal Institute of Technology in Zurich, Switzerland. "We found that dendrites of cells lacking cdk5 seemed to integrate into the brain no matter what direction they grew in," he says. Gage notes that the findings "reflect the need for therapeutic approaches that will assure that cells used in regenerative medicine are strategically placed so that they will make appropriate rather than promiscuous connections." Newborn neurons deficient in cdk5 (green) extend aberrant dendrites that nonetheless synaptically integrate into the pre-existing dentate circuitry containing neurons (red) and glial cells (blue). From: For New Neurons in an Old Brain, cdk5 Shows the Way Robinson R PLoS Biology Vol. 6, No. 11, e291 doi:10.1371/journal.pbio.0060291.